The Lakers, who finished 35-47 last season, have a win total of 48.5 — tied with the Utah Jazz for fourth-most in the Western Conference — as they embark on the first year of the LeBron James era in Los Angeles. The Los Angeles Lakers haven’t made the NBA playoffs since 2013, when they were swept in the first round by San Antonio. The Spurs own the longest active playoff streak, at 21 consecutive seasons, in any major North American pro sports league. Based on NBA regular-season win totals posted Sunday, the oddsmakers at the Westgate sports book expect both of those streaks to end in 2019. James helped the Miami Heat improve by 11 wins in his first season with the team in 2010-11 and the Cleveland Cavaliers bettered their record by 20 wins in his return to the franchise in 2014-15. 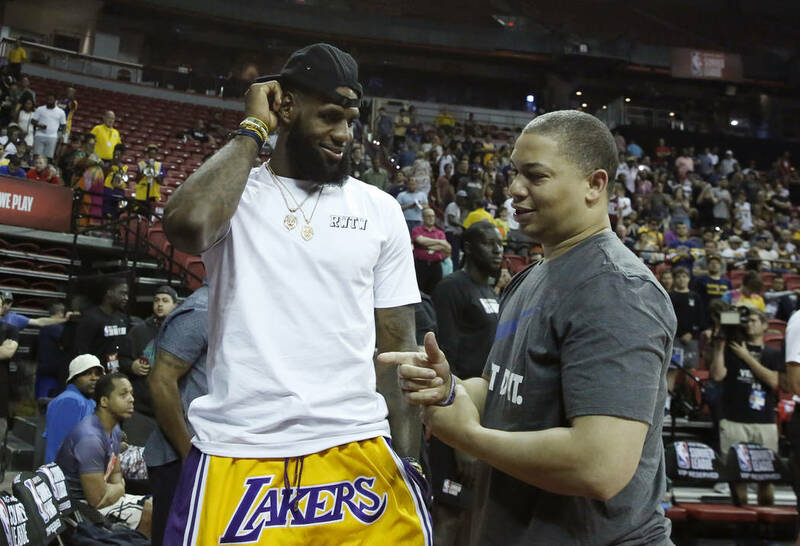 The Westgate projects the LeBron-led Lakers to improve by 13.5 wins in the loaded Western Conference. After being 10-1 underdogs to make the playoffs last season, Los Angeles is a 5-1 favorite to make the postseason next year. San Antonio hasn’t missed the playoffs since 1997, the season before Tim Duncan arrived. Despite the Spurs acquiring All-Star guard DeMar DeRozan from the Raptors in a trade for Kawhi Leonard, who missed all but nine games last season, their win total of 43.5 ranks ninth in the West. Two-time defending NBA champion Golden State has the highest win total, at 62.5, after finishing 58-24 last season, well below their win total of 67.5. Houston is tied with the Philadelphia 76ers and Toronto Raptors with the league’s third-highest total, at 54.5. The Rockets went 65-17 last season before losing Trevor Ariza in free agency. They’re expected to add Carmelo Anthony, but Sherman believes they will take a step back. The Celtics have the highest total in the East and second-highest overall, at 57.5, with the returns of Kyrie Irving and Gordon Hayward. Boston went 55-27 last season. Phoenix was the only team that saw its opening win total move, from 28.5 to 29.5, after a $2,000 limit bet. The Westgate also took $1,000 wagers on the Lakers (under), Spurs (under) and Timberwolves (over 44.5).